Shikata-san came up with the idea of entering walls, but he wasn’t sure what was fun about it. What happened then? At first, they said it would take about one week. I guess you were surprised to see your own idea running like that? Yeah. The moment I saw it, I was certain it would fly. It’s good to have a team you can rely on. Yeah! (laughs) And that prototype gave rise to all kinds of ideas. 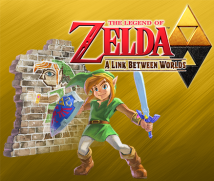 The idea of entering walls came up, and then Link, who had been 3D, became 2D by entering walls, and he was able to go smoothly around corners. That had a lot of applications in allowing him to go places he couldn’t before, creating new puzzles, and providing material for new mechanics. When you made that prototype, was it a direct top-down view like in A Link to the Past? No. As in Spirit Tracks, the viewpoint was overhead from an angle. At the time, we were thinking of it as an extension of the Nintendo DS games. I brought that prototype today. Iwata-san, would you try it out? Sure. (taking the Nintendo 3DS system) Link looks like he’s from Spirit Tracks. Yeah. He was still Toon Link . Oh! I went into the wall! I don’t think I’ve ever seen anything like it! (plays in silence) I see… You got riled and made this in one night? Well, I didn’t make this whole thing in one night. At that time, I only made the turning corners part. With a prototype like this, you would usually go on to enter serious development based on it. The director can explain that. Okay. When we showed this to Miyamoto-san, he said, “Let’s do it.” And we were excited, too. But before two weeks had passed, we got involved in launch titles for Wii U. About two years before the release of Wii U. They absolutely needed more people to work on the Wii U launch titles. So other projects took this project’s core members. So at the time I lost hope. I had hardly ever heard of a project starting, disbanding, and then starting up again later. You had come up with a great idea, but feared it would never see the light of day. But when they left the team, they would leave parting gifts. They put a sticker with the development code name on a Nintendo 3DS with the prototype in it – like a student giving a favourite teacher a present at a graduation ceremony – and gave it to Miyamoto-san, Tezuka-san10 and me.10. 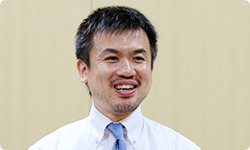 Takashi Tezuka: Executive Officer, Software Development Department, Entertainment Analysis & Development Division. 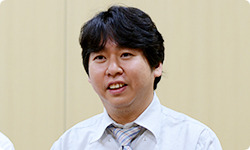 He has been involved in the development of many series such as Super Mario, Yoshi and Animal Crossing. He has appeared in sessions of “Iwata Asks” over New Super Luigi U, the original Super Mario developers for the 25th anniversary of Super Mario and the producers of Super Mario 3D Land, as well as in the special edition sessions of "Iwata Asks" for E3 2012 covering New Super Mario Bros. U and New Super Mario Bros. 2. I thought, “There’s no way we can forget this,” but at the time, I had to develop Skyward Sword. How about you, Shikata-san and Mouri-san? After that, I developed Nintendo Land11 and Mouri-san developed New Super Mario Bros. U.12 Incidentally, for Nintendo Land, I worked on The Legend of Zelda: Battle Quest.1311. Nintendo Land: An interactive theme park game released simultaneously with the Wii U console in November 2012.12. New Super Mario Bros. U: An action game released simultaneously with the Wii U console in November 2012.13. The Legend of Zelda: Battle Quest: One of 12 attractions included in Nintendo Land and based on Nintendo games. One player uses the Wii U GamePad like a bow and arrow while up to three other Links use Wii Remote controllers like swords to co-operate in clearing a stage by defeating monsters. So your background developing Zelda games since Ocarina of Time wasn’t interrupted. Right. I threw all my enthusiasm that I had for The Legend of Zelda into Wii U.